The big story at the Olympic games forty years ago was the violent deaths of eleven Israeli athletes and coaches at hands of the Palestinians who were part of group called Black September. In the early hours of September 5th, eight terrorists slipped into the apartments of the Jewish Olympians, taking them hostage with the goal of forcing the freedom of over two hundred fellow militants who had been captured and held as prisoners in Israel, along with two radicals jailed in Germany. Two Israelis died resisting the initial attack. Nine hostages remained in the hands of the Palestinians as they tried to win their negotiations. Israel refused to negotiate as they believed giving any success to such threats would only encourage more attacks. Instead, Israel offered to send in some of their special forces to Germany to resolve the situation. The host country refused the offer, then offered the hostage takers massive amounts of money or substitution of high ranking officials. The terrorists countered by saying, “money means nothing to us; our lives mean nothing to us.” This may give us a clue today as to why it is difficult to coexist and negotiate with dedicated evil. After the attackers demanded a plane to Cairo, and the Israelis agreed, an ambush was planned at the Munich airport. Unfortunately the coordination and dedication of the German forces failed and, instead of competing in an event intended to promote friendship and world peace – the other nine died as well. The Germans had been warned of the possibility of such an attempt by consultant Georg Sieber… and even received a tipoff the the attack was in the works. However, because they did not wish to have such a security presence in and event billed as open and friendly, they refused to act on this knowledge. We would do well to keep this attitude and these results in mind as we live our lives today. Just four years after this man-made tragedy, the International Olympic Committee refused to recognize the horror of 1972 on the grounds it may alienate other competitors. This is the very same reason the timid organizers used this year. Apparently courage is short supply among these internationalists… or they do not value Jewish lives. 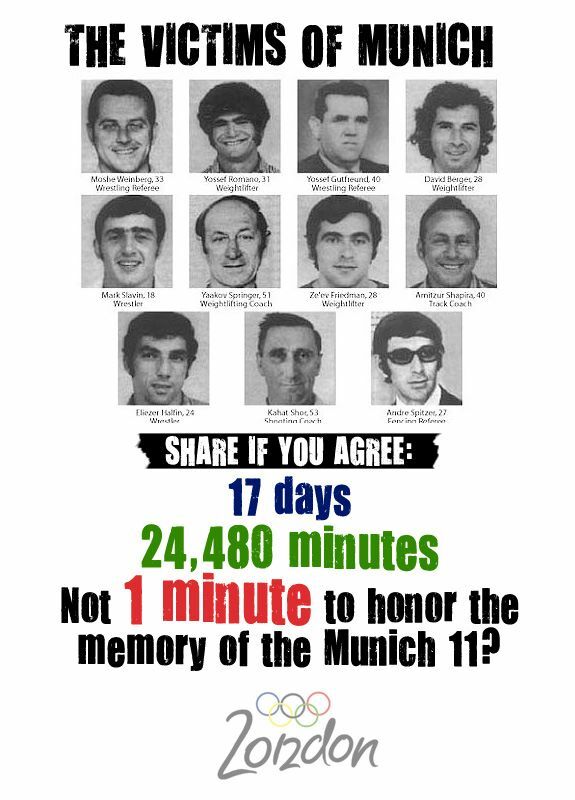 Those who foolishly believe we can negotiate and coexist with people who want Israel (and us) dead cannot comprehend why the tragedy at the Munich games is something to be remembered. Their overall goal of having us all hold hands and sing kumbaya is of so much more consequence than the deaths of several athletes from the “renegade” state of Israel. It is almost a bother to them to be asked to commemorate the event. The only other reason would seem to be that these world elites are frightened by Islamists around the world… in which case, their total lack of courage makes them a completely unreliable reference point for the normal people of the world. In any case, the refusal by the IOC to recognize the sad day forty years ago because people may be upset is utter foolishness. Many of those objecting to even a minute of silence in remembrance are descendant of the the very same people who have been terrorizing the world for decades. It is apparent that the leaders of the IOC care more about these killers than they do about our common values… which means they do not share our common values anyway, and we need to understand this when we hear them and deal with them. These eleven athletes and coaches lost their lives simply because of their ethnic background… you can’t get more racist than that. We need to keep in mind that they were minding their own business and members of the ficticious race called “palestinian”, filled with hatred, slaughtered innocents who were in Germany for friendly athletic competition. So many people refuse to even recognize the evil exists. It would seem that the events of 1972 are a perfect proof that it does exist. What say you?